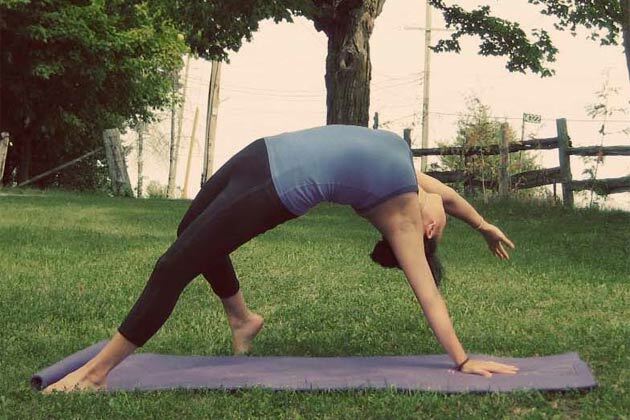 Downward-Facing Dog Pose (Adho Mukha Svanasana) is a fundamental posture in yoga because it feels awesome all over and has so many kickass benefits. It calms the brain and the nervous system and stretches while strengthening the back, hips, legs, arms, and shoulders. It lengthens the spine and creates space between the vertebrae. It works the core and gives your body all the benefits of inversions without having to make you go completely upside down. It's a wonderful pose to build strength in the biceps, triceps, shoulders, and upper back to prepare you for more challenging postures. By working with gravity to open your hamstrings, it also has all the qualities of a Forward Bend. One of the best things about yoga asana is that there is always somewhere to go, something to try, and something to play with. So as your practice evolves and your Down Dog starts to feel like it needs a walk in the park, try one of these four variations. From Downward-Facing Dog, extend one leg back and up as your reach the leg out of the hip. Square the hip. Take 5 deeps breaths and switch sides. This variation deepens the stretch in the hamstrings and strengthens the muscles in the extended leg. From Three-Legged Dog, lengthen through the spine and open your hip to the sky. Bend the knee of the extended knee and draw your heel toward the bum. Try to keep your shoulders even and squared with the front of your mat. Zip up your belly and squeeze your naval into your spine. In addition to the benefits of Down Dog and Three-Legged Dog, this variation helps open and lengthen through the side body—subtly transforming your posture. While traditionally thought of as its own posture, Wild Thing to me is a variation or an evolution of Downward Dog. From Down Dog, slide your left leg in front of the right and open your torso and heart to the sky. Extend your top arm down over your head. This variation continues to build strength in the arms, but it also opens the hip flexors and chest, while improving circulation. From Down Dog, begin to take more weight into your left hand and legs to make your right hand light. Reach your right hand to the outside of your left thigh. Slide your hand down your leg as you spin your chest toward the sky. Maybe your hand reaches your calf, or even your ankle. Like with all tight twists, refrain from this if you’re pregnant or if you have any back injuries. This variation is fantastic for independently strengthening each arm. Our bodies are beautifully asymmetrical, so while you move through this pose, notice these asymmetries, but try not to judge yourself for them. The addition of the twist in this variation stimulates digestion, detoxifies the body, and adds a new balancing challenge to play with. As you experiment with these variations find the balance between effort and ease—between sthira and sukham. Sthira is a Sanskrit word that means effort, and sukham means ease. So while your Downward Dog evolves and your practice grows, be gentle on yourself and do what is most nourishing for your body, right now. Go with the flow and let go of preconceived notions of where you ‘should’ or ‘shouldn’t’ be in your asana practice. Your body is wise and it is your best teacher…all you need to do is listen. 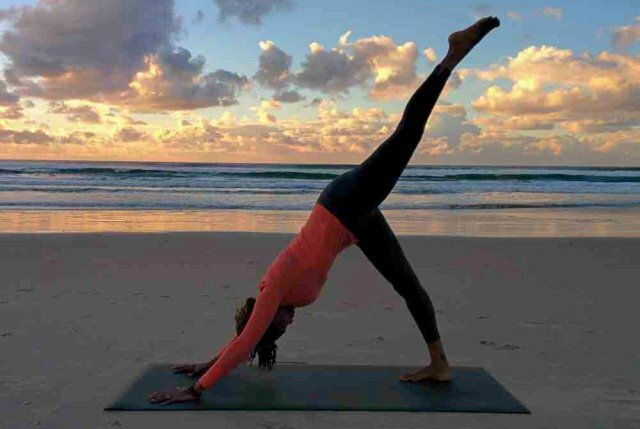 What are your favourite variations for Downward-Facing Dog Pose? Share your thoughts, experiences, and tips with us here on DOYOUYOGA!